Where medieval Denmark and Scandinavia as a whole has often been seen as a cultural backwater that passively and belatedly received cultural and political impulses from Western Europe, Professor Michael H. Gelting and scholars inspired by him have shown that the intellectual, religious and political elite of Denmark actively participated in the renaissance and reformation of the central and later medieval period. This work has wide ramifications for understanding developments in medieval Europe, but so far the discussion has taken place only in Danish-language publications. 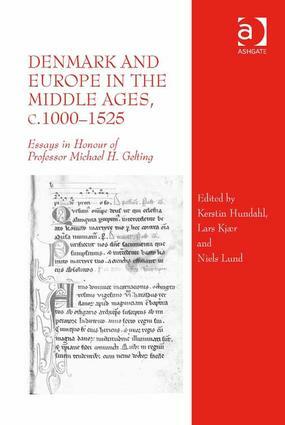 This anthology brings the latest research in Danish medieval history to a wider audience and integrates it with contemporary international discussions of the making of the European middle ages. Contents: Introduction, Kerstin Hundahl and Lars Kjær. Part I Religious Culture: The settlement of disputes by compromise according to some early Danish charters, Kim Esmark; Byzantinizing crucifixes in central medieval Denmark: how, when and why, Ebbe Nyborg; Motherhood as emotion and social practice: Mary and Anne as maternal models in medieval Iceland, Agnes S. Arnórsdóttir; The Black Friars and the Black Death: effects of the plague on friars preachers in 14th-century northern Europe, Johnny Grandjean Gøgsig Jakobsen. Part II Intellectual Culture: Contacts between Denmark and Flanders in the 11th and 12th centuries: the tiniest of evidence, Steffen Harpsøe; Banking on - and with - the Victorines: the strange case of Archbishop Eskil’s lost deposit, Mia Münster-Swendsen; The transformation of the Danish language in the central Middle Ages: a case of Europeanization?, Niels Houlberg Hansen; Two journeys and one university: King Christian I and Queen Dorothea’s journeys to Rome and the foundation of the University of Copenhagen, Carsten Jahnke. Part III Legal Culture: The Church law of Scania on the consecration of churches and the appointment of parish priests: international canon law and that of Scania, Bertil Nilsson; Dating the laws of medieval Denmark: studies of the manuscripts of the Danish church laws, Per Andersen; Regional or central? Legislation and law in 13th-century Denmark, Helle Vogt; Border warfare between king and pope in late medieval Denmark: a case study of royal politics towards ecclesiastical benefices and papal provisions c. 1350-1525, Per Ingesman. Part IV Aristocratic and Court Culture: Apocalypse then? The First Crusade, traumas of war and Thomas de Marle, Thomas Kristian Heebøll-Holm; Rune, knives and Vikings: the Valdermarian kings and the Danish past in comparative perspective, Lars Kjær; Placing blame and creating legitimacy: the implications of Rügish involvement in the struggle over the succession amidst the Danish church strife c.1258-1260, Kerstin Hundahl. Index. Kerstin Hundahl is a PhD fellow in the history department in Lund University, Sweden. Lars KjÃ¦r is Lecturer in Medieval History in the New College of the Humanities, UK. Niels Lund is Emeritus Professor of History in the University of Copenhagen, Denmark.